Community members angry at a dramatic increase in city officials’ attacks on the homeless gathered at the office of one of the principal organizers of the removal 46th Ward Alderman James Cappleman on Monday. 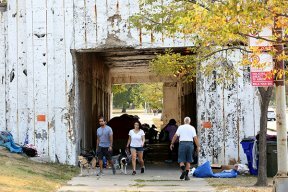 In beating back an appeal by homeless rights activists for a federal court injunction to temporarily halt the September 18th eviction of homeless people at the Lake Shore Drive viaducts, City attorneys argued that the eviction would not lead to a generalized attack on the homeless and that homeless people would not be harmed. This is precisely what happened. Following the first eviction, Chicago police commanders have repeatedly threatened to arrest anyone who pitched tents anywhere on City property without public way use permits, each of which require passage of special legislation by the City Council, hundreds of dollars in fees, million-dollar insurance policies, and months if not years of preparation. The evictions increased trauma for people already in a highly stressful situation, and at least three homeless people suffered medical crisis during the series of evictions following the closure of the LSD viaducts. Homeless rights advocates and attorneys for homeless individuals say that by denying people’s right to sleep in public with tents, which helps protect their safety in Chicago’s harsh weather, the City’s actions amount to criminalizing homeless people as a class, a violation of the Eighth Amendment to the US Constitution. 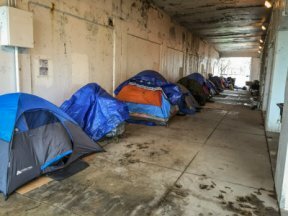 “This is just the latest, and perhaps most outrageous of Alderman James Cappleman’s multi-pronged, years-long effort to drive homeless people, poorer people in general, and people of color out of the 46th Ward,” said Uptown Tent City Organizers’ Andy Thayer, co-plaintiff in the federal suit. “James Cappleman has been a longtime opponent of working class people in the ward, prioritizing development for upper income newcomers while destroying homes and services for modest-incomed people who have long lived here. His goal: Lincoln Park North, a trendy playground of boutiques and entertainment venues for whiter, richer, newly-arrived residents. Along the way, he’s enriching his developer friends and campaign contributors by doing their bidding.” Monday night’s protest is organized by Uptown Tent City Organizers, a group of housed, homeless, and former homeless residents that formed in the spring of 2015 to halt illegal and unconstitutional attacks on homeless people, and to give what direct aid to the homeless that they can.